After a brutal start to 2009, the Dow Jones has rallied in recent months, and after Friday’s close the major average is now in positive territory for the year, printing the tape at 8799.26. One of the main reasons for the Dow’s upside and that of other exchanges for that matter, according to E.S. Browning’s piece in Sunday’s WSJ, is disarmingly simple: governments around the world are injecting money into the economy at a frenetic pace, resulting in global financial markets once again to be awash in government cash. From The WSJ: The U.S. government alone has allocated $11.4 trillion to direct and indirect stimulus in the past two years, of which about $2.4 trillion has been spent, according to an estimate by Daniel Clifton, head of policy research at New York’s Strategas Research Partners. The money is gushing from direct grants, central-bank lending, tax breaks, guarantees and other items. China has announced plans for $600 billion in direct stimulus spending; Russia, $290 billion; Britain, $147 billion; and Japan, $155 billion, according to Strategas. Those countries and others are spending trillions more indirectly. Silver is up 59% from December lows on futures markets; copper is up 90%; corn, 45%; and crude oil, 113%. Ukraine’s stock market is up 125%, Vietnam’s 116%, Indonesia’s 76% and India’s 87% from winter lows. In Shanghai, crowds are back on weekends on Guangdong Road, where locals gather to chat stocks. Tan Viet Securities Co. in Hanoi says it is opening or reactivating 50 accounts a day, up from five to seven in March. Optima Securities, a brokerage firm in Indonesia, says the number of new accounts has doubled in the last three months. The oil-price rebound is boosting costly projects such as western Canada’s oil-sands fields. Imperial Oil Ltd., majority-owned by Exxon Mobil Corp., said May 25 that it is moving ahead with a delayed $8 billion project near Kearl Lake. Canada’s stock index is up 41% since March 9. 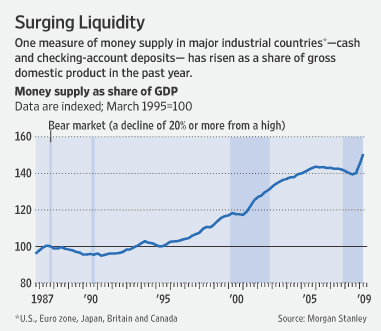 While the availability of cash coming from all directions is helping revitalize and get the financial markets going again ; if the recession proves more lasting than the optimists believe, liquidity injection alone may not be enough to keep financial markets rising. Let’s keep in mind that coordinated central bank operations, together with rate cuts, have certainly helped ease liquidity tensions. However, the combination of liquidity with weak fundamentals and low velocity of money is not likely to generate economic growth. Furthermore, if the Fed fails to mop up the money, the consequence for the U.S. economy could be severe inflationary pressures and a collapsing greenback. We better play it smart this time.